June 24, our specialists held the first lecture of our exclusive course in Higher School of Business Informatics. PHOENIX POINT: PETTY REMAKE OR A UNIQUE WORK OF ART? One of the highlights of E3 2016 was an announcement made by original X-COM devs who stated their intention of making their own independent turn-based horror game without any help and influence of Firaxis Games. And that’s how Phoenix Point’s story has begun, making the biggest gaming related media fall in love with it. It’s time for you to boost your patriotism, drink some vodka in the company of your pet bear and enjoy something kawaii. Vanquish has been out for seven years and hasn’t changed a bit during the time. Though PC version gained more graphics options, neat keyboard and mouse controls together with fantastic performance. Last May our department of internal education, called Bytexclass has gone into action. Here we train our newcomers the basis of their new profession. The course includes three lectures: An introduction, where people are taught what the bug is, types of testing and its’ approaches, a lecture of web-testing and a lesson on test documentation. Each of them is provided with practice, based on company’s real projects. The course is also free to visit for any of our employees. Besides, we have training events from professionals of the industry. We have already hosted representatives of world’s biggest companies and will definitely try to make such events more frequent. All our workers already know Alina. She is our English teacher. Alina has got 7 classes with general amount of 78 students. They all are separated into groups, dependent on their basic knowledge and are taught for free. Classes are provided with Lenovo AIO. 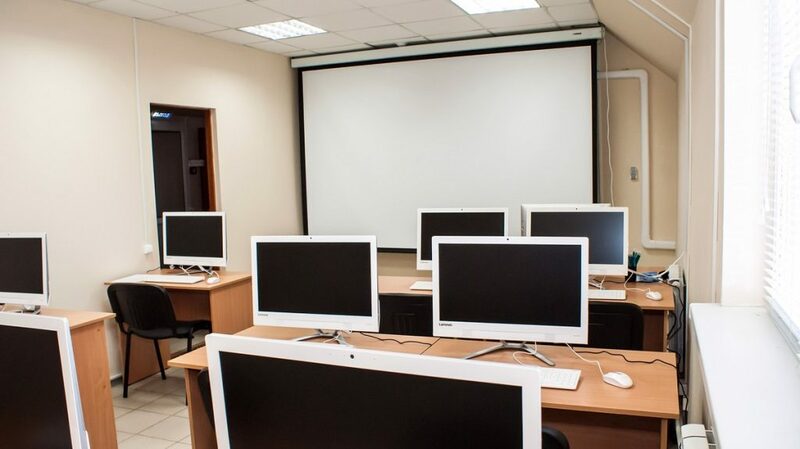 Our next step is to set up a chain of advanced courses, on which our employees will be taught peculiarities of testing: from advanced knowledge of databases to working with test-automatization tools. We had to take a long pause from the game after its release in order to come back to it with a clear mind. Having done so we can truly restate that For Honor is an amazing game, with a fantastic gameplay which, unfortunately, was ruined by P2P and the worst matchmaking you have ever seen. Having clarified that, we can delve into performance testing. We had a spare Radeon HD 7850 GPU and i5-4440 processor, so we decided to check if the game runs with such specs. Our curiosity was satisfied to the full extent. It’s not common for a game in 2017 to run at 30FPS on high (!) settings on a relatively old GPU. Spoiler alert: we can’t really say anything bad about game performance. Fantastic graphics combined with perfect optimization is a win. The official game page on Steam gives you a list of 9 GPUs in minimum system requirements list and 7 more in recommended. A couple of Intel and AMD processors are listed as well. Being generally busy we couldn’t afford testing this game on 16 GPUs – that would be a colossal waste of time and human resource. Thus, we took two GPUs – the least and the most powerful ones from the list – and found out that game optimization is so good that even your wildest fights won’t overheat a good old GTX660. In fact, it won’t heat it at all. Nothing supernatural, but this time Ubisoft did a very good job. Such an extended requirements list allows For Honor to be played on computers of all sorts. As usual, we’ve got it all covered. As you can see, game performance can drop to zero on high and very high settings from time to time, showing 38 FPS on average for both high and very high at the same time. There are not many games out there that wouldn’t drop FPS drastically on maximum settings – something that you should always be prepared for. If you’re a lucky owner of GTX1060 you won’t experience a single problem with the game. Performance drops to 60 FPS only when it’s absolute hell in game, which again goes back to normal instantly and unnoticeably for a human eye. It never goes lower that 50FPS. EVER. In comparison with PUBG, For Honor is optimization Heaven on Earth. 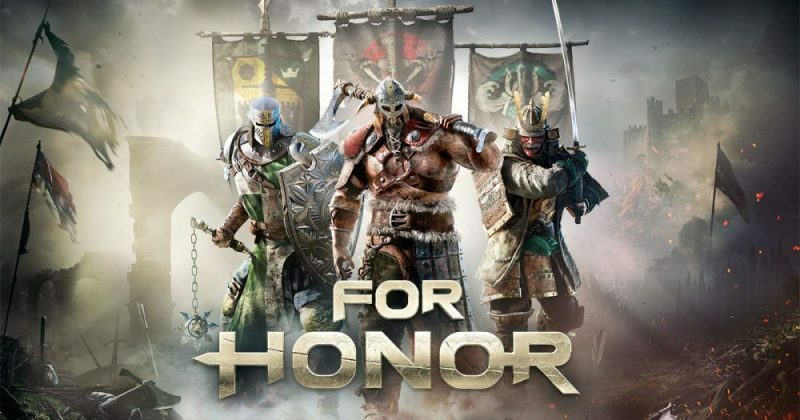 If you got time for non-stop gaming, prestige and equipment upgrading, perfecting your reflexes while suffering from pain and humiliation – welcome to For Honor – a game where getting a better gamepad is much more important than upgrading your PC. Though, check Ghost Recon out if you care for your mental health. PLAYERUNKNOWN’S BATTLEGROUNDS: BROKEN GAME OR POTATO COMPUTER? Battle Royale is a unique genre which cannot leave you indifferent. You either consider it a joke, or approach it in all seriousness. Playerunknown’s Battlegrounds has already been a huge success and it’s definitely going to set a new bar not just for the genre itself, but for the gaming industry in general. The only thing that stops some people from buying the game is the uncertainty of their computer being powerful enough to run the game. If you’re one of those people, this article is exactly what you need to figure it out. Playerunknown’s Battlegrounds got its name after the nickname of its creator Brandon Greene most known as PlayerUnknown. His record includes DayZ mode for ARMA, H1Z1: King of the Hill and PUBG itself which, unlike DayZ and H1Z1, has been a product of Brandon’s own company Bluehole, Inc. PlayerUnknown is truly a sage of the genre since he practically invented it. One hundred players are being dropped on the island 64 square kilometers in the area where they should loot houses in search for a perfect weapon, make sure they are in the constantly shrinking playing zone also known as “the circle”, and of course, make it to the very end. As soon as you see someone you shoot or get shot. Plane trajectory is always random and so is loot. Every once in a while, there’s a red zone in the random place of the map and you better be far away from the air bombing attack or lay low in first house you can find. Clothes, weapons, add-ons and items haven’t changed much since the initial public release, but are still very diverse. You can get a suppressor for a loud weapon as well as scopes which vary from red-dot ones to 8x and if you’re lucky, you’ll get a 15x beast in the air drop. In addition to that, you can come across extended magazines and foregrips for weapons of all sorts. Experienced DayZ players might find it hard to get used to PUBG’s ballistics, but it gets better with time and bullets eventually start damaging your enemies. Sometimes you just have to aim a little higher. The game is heavily bugged. However, you can’t judge it yet since PUBG is still in early access. Besides, it’s being constantly patched. Lagging and freezing will not be a huge problem for a modern hardware users, but visual and sound bugs can destroy your game experience sometimes. Developers haven’t revealed recommended requirements yet, though minimum ones are already available. Based on them we created two platforms for a complete performance testing. Each configuration took us about half an hour to test which equals to an average time spent in a game. For the accuracy of the experiment we should have done exactly the same things in exactly the same order on both platforms to create an identical system load which is quite impossible while playing Battle Royale and PUBG in particular. Thus, the more random the game is the harder it gets to come up with ideal performance testing results. As you can see, our platform configurations are identical to the minimum system requirements. The only thing is we haven’t substituted Windows 8.1 for something better working because apparently some people still use the OS. 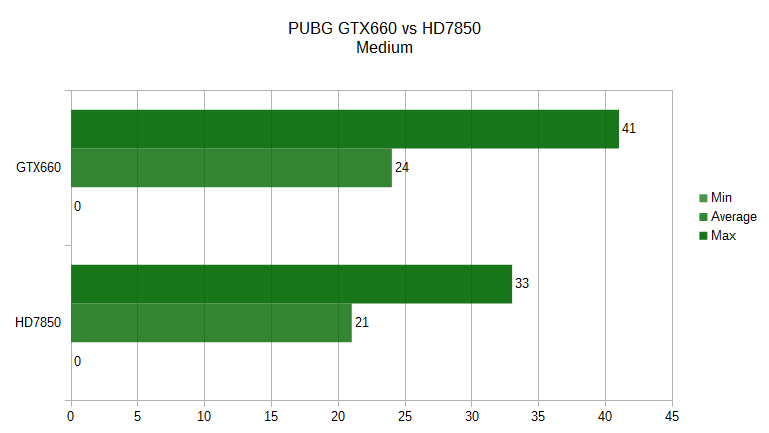 You can also take a look at FPS charts for platforms with GTX 660 and HD7850 and comparison diagrams further in the text. You probably noticed that only one diagram has three lines in it which shows that at certain moments game reached an absolute zero performance. Something you can expect from early access games and there’s nothing much you can do about it. The fact that performance has never gone lower than 2 FPS on low settings is either our luck or some amazing game optimization. 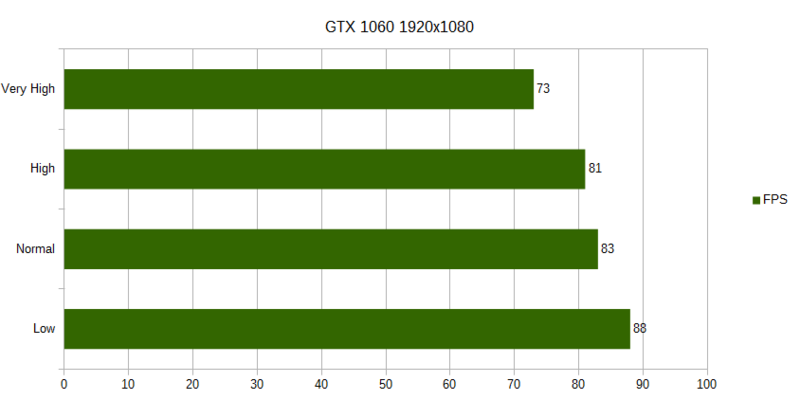 In general, Nvidia has a slight advantage over AMD showing higher or same FPS rate on most settings. 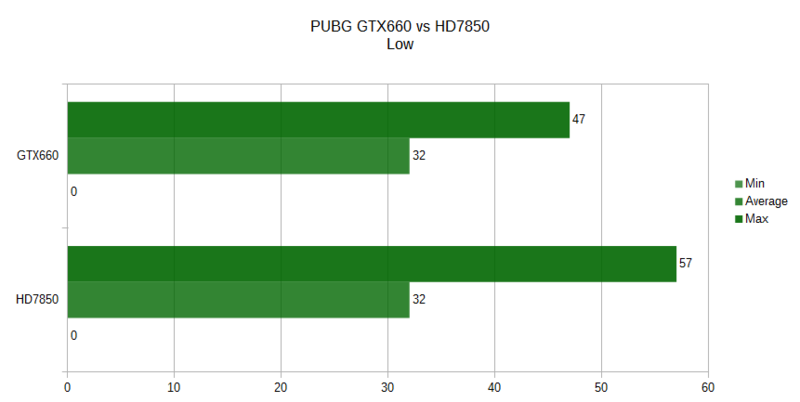 Only on low does AMD get a higher score in max FPS, however showing the same average performance as Nvidia. The first thing you need to do before launching Playerunknown’s Battlegrounds on low settings is to get ready. At the moment, not even Nvidia 1080ti can save you from experiencing lagging and freezing. Next thing you need to do is disable all applications that can load your system. Say goodbye to gaming centers, browsers, graphics software, Skype (unless you’re playing as a team, but better use Discord for that), VPN and even office documents. With PUBG you wouldn’t want any other process to run at the same time. Don’t forget to check your driver update. Nvidia has already released a new version for the latest PUBG patch. Finally, relax. System requirements won’t go any lower and the upcoming optimization will give you ten more FPS at best. So, if you’re struggling with 25 FPS on your AMD HD7850 it’s time to say goodbye and get a new GPU. After all, changing the resolution to 720p will not help much. Good news is you don’t have to spend a fortune on a new GPU. 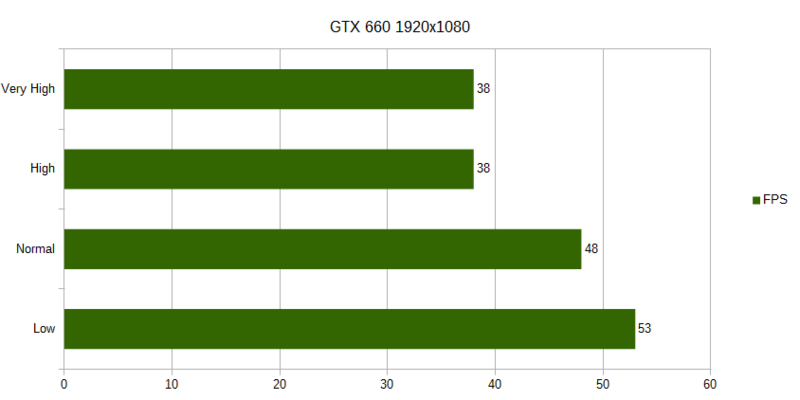 Even with an AMD CPU, your Nvidia GTX750ti will run the game quite alright. Our testing results showed 42 FPS on low, 28FPS on medium and 19FPS on high. 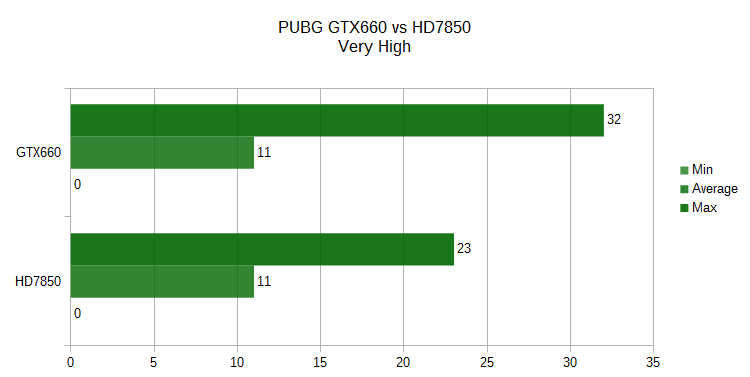 If you follow gaming industry news you probably know that GTX660 and HD7850 are not miracle workers. Modern games can hardly be played on them and if you still own one, it’s time to upgrade. Brendon Greene is famous for quitting his previous projects leaving them in beta forever. PUBG’s developers claim to release the final project within six months after early access launching. Even though the game’s design document isn’t that big and the concept itself is getting old our testing proves that there are all chances for a successful PUBG release. Especially since all the patches have only improved the game so far. Tea, coffee, YouTube videos? 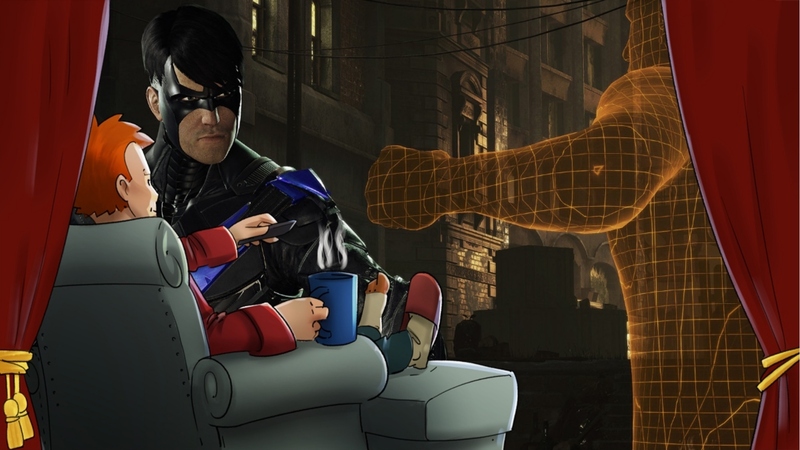 Today’s list is: Agents of Mayhem, Persona 5, Prey, Ijustice 2 and Batman: Arkham VR. 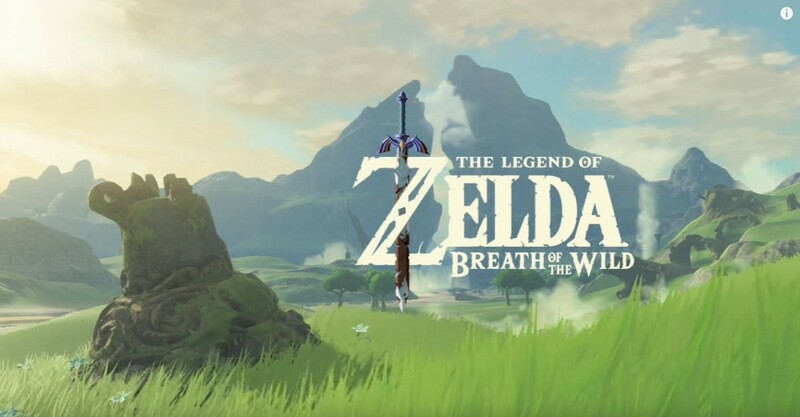 Bad news for those, who had bought The legend of Zelda: Breath of the Wild Nintendo Switch Edition and good ones for kings of games with $3000 PCs. Warhammer Age of Sigmar Fantasy Battles are extremely lucky. Marvellous, wonderful, amazing and great Creative Assembly gives out it’s map constructor Terry for Total War: Warhammer. Here we are again streaming For Honor. Last time we discussed it on our russian live broadcast and now switch to the universal one. Begin as it’s said, 8 pm PST! We even have a little intro for those, who haven’t tried it before.